Greetings to all the fine pooches of Movies at Dog Farm. This is your temporary (g)host, the Info Zombie. There is nothing wrong with your web browser. Do not attempt to adjust the picture. I am controlling transmission. If I wish to make it louder, I will bring up the volume. If I wish to make it softer, we will tune it to a whisper. I will control the horizontal. I will control the vertical. I can roll the image, make it flutter. I can change the focus to a soft blur or sharpen it to crystal clarity. For the text below, sit quietly and I will control all that you see and hear. I repeat: there is nothing wrong with your Dog Farm. You are about to participate in a great adventure. You are about to experience the awe and mystery that reaches from the inner mind of The Info Zombie to — The Outer Limits. Or at least the Dog Farm, anyway. In true Halloween fashion, Brandon and I are switching bodies. Bodies of text, that is. I am submitting this to the Dog Farm readers, and Brandon will cook up something good for those hungering for brainy stuff at The Info Zombie. Since Brandon does such an admirable job examining horror movies, I will not try to emulate the outstanding work he produces. Instead, I will celebrate a horror movie icon. Let’s give a strong, Dog Farm bark to Jeffrey Combs. Trained on the West Coast, Combs graduated University of Washington’s performing arts program and transitioned to the stage. In 1981 he appeared in his first film role as the drive-in teller in Honky Tonk Freeway. From that nominal role grew a career of being the most recognizable face in horror films. 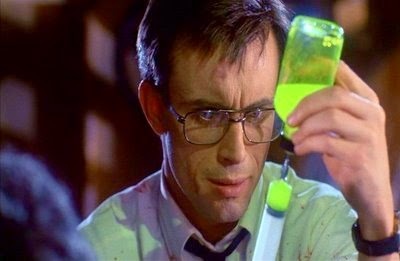 Combs, best known for the Re-Animator series, has appeared in five adaptations of H.P. Lovecraft works. Splitting time between stage, television, and film, the actor has portrayed some of the great authors including Edgar Allan Poe, Lovecraft, and even L. Frank Baum. He’s been in space on Star Trek and even animated in several forms including The Question of The Justice League, and the Autobot Ratchet. A go-to actor for Stuart Gordon, others including Lord of the Rings director Peter Jackson tapped the actor for some small roles made big courtesy of Combs. He often plays the determined, quiet type with a severe intensity. Combs’ portrayal of Herbert West crafted the archetypal performance of the eccentric genius. Even his delivery in the forgettable Would You Rather (2013) comes off with an undercurrent of odd that causes hairs to stand erect. Watch House on Haunted Hill (1999) to get Combs delivering a nightmare generating performance sans dialogue. His stare from behind Dr. Vannacutt’s surgical mask holds the intensity of a bullet in the chamber on a one-way ride. Although his career has since shifted to voice overs for cartoons, the star has performed in short films, video games, and theme park rides. As of this article’s production, Combs will be appearing in films like Art School of Horrors (2015). This year will mark the thirty-third of film work for this actor celebrating six decades of quality living. We can’t get Jeffery Combs an Academy Award©, but we can do the man a solid by visiting his website, renting his movies, and giving the man some notice on social media. Don’t let someone who has entertained us so well go on without some slight recognition. If you catch him at a Horror Con, let him know how you appreciate his work. Best of all, a spike in his movie sales and rentals will show the industry that we know how to treat our valued actors. We now return you to your regularly scheduled Dog Farm. As we say over in the scholar’s cemetery, Keep rising from the graves of ignorance, my Zombies! 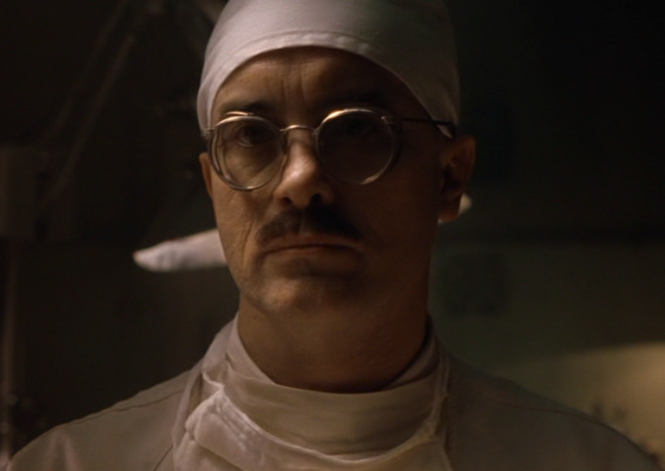 I love Jeffrey Combs! He was the best thing about The Frighteners. Glad to see his role in Honky Tonk Freeway mentioned alongside the horror work.